Avocado Grafting Workshop - Kona HAA - Welcome Coffee Growers! Kona Cooperative Extension Service – Conf. Rm. 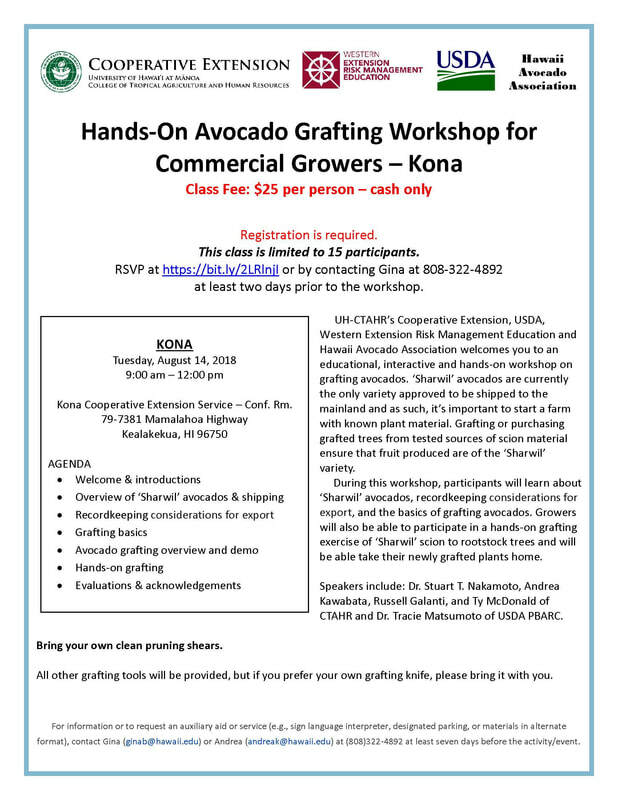 UH-CTAHR’s Cooperative Extension, USDA, Western Extension Risk Management Education and Hawaii Avocado Association welcomes you to an educational, interactive and hands‐on workshop on grafting avocados. ‘Sharwil’ avocados are currently the only variety approved to be shipped to the mainland and as such, it’s important to start a farm with known plant material. Grafting or purchasing grafted trees from tested sources of scion material ensure that fruit produced are of the ‘Sharwil’ variety. During this workshop, participants will learn about ‘Sharwil’ avocados, recordkeeping considerations for export, and the basics of grafting avocados. Growers will also be able to participate in a hands‐on grafting exercise of ‘Sharwil’ scion to rootstock trees and will be able take their newly grafted plants home. Speakers include: Dr. Stuart T. Nakamoto, Andrea Kawabata, Russell Galanti, and Ty McDonald of CTAHR and Dr. Tracie Matsumoto of USDA PBARC. Bring your own clean pruning shears. Download the flyer and view directions to the Kona Extension Office by clicking the flyer above. Registration is required for each attendee. This class is limited to 15 participants. If you register and are unable to make the workshop, please contact Gina at 808-322-4892 or Andrea at andreak@hawaii.edu. There may be a wait list and we would like to provide someone else with the opportunity to attend the workshop. Contact website management if you require any assistance with the site or information provided.